In David Yarovesky’s sci-fi horror The Hive (2015) the internet is positioned as a precursor to a dystopian future. The film follows a group of rural summer camp employees who attempt to avoid infection from a black, viscous substance which causes people to become connected to a larger neural network at the sacrifice of their individuality and mobility. Throughout the film, people who become infected comment on how much better it is to be connected to the network, even though they are shown to be in a state of decay (see Figure 1). When the central character of the film, Adam, becomes infected, his realisation that he can learn anything through taking memories and information from other people is encapsulated in his statement that being part of the network is “just like Google”. Adam, however, briefly frees himself from the infection through the use of memory and emotions, allowing him time to consider how to permanently disconnect from the network. His solution treats the human body much like a computer; making the heart stop and then inducing an electric shock to restart it, much like the often practiced ‘turn it off and on again’ solution to various computer issues. The Hive makes explicit the link between the infection and the internet. It posits that becoming ‘always online’ has rooted people and that allowing people to experience everything vicariously through the internet has halted the progression, exploration, and construction of identity necessary for the human race to continue. During the film’s finale, as Adam escapes with his partner Katie through desolated landscapes full of the infected, he laments that “there is nowhere left to go […] everything is not going to be okay”. In saying this The Hive calls attention to our growing dependence on internet-connected and always online technologies, arguing that the notion of society as we understand it today is in danger of being lost as humans continue to look to the internet for experience, information, and self validation. Figure 1: An infected, and therefore ‘connected’, person in The Hive (2015). Though The Hive is clearly discussing contemporary technology, it does so in a way which hides the technology it is discussing, that is to say that the technology itself (the computer or the internet) is not manifest within the film. Other than brief comments comparing the hive mind to Google, and minor CGI sequences which posit the brain network as a database of information, there are no efforts made to examine the technology of the internet itself. Instead, The Hive opts for analogy, focusing on the infectious liquid as synonymous with connectivity and therefore providing a visual representation of the numerous invisible signals, hidden wires, and masked coding which allow for the internet to exist. By instead focusing on an invasive foreign body, The Hive harks back to body horror films such as David Cronenberg’s Videodrome (1983) and Shinya Tsukamoto’s Tetsuo: The Iron Man (1989), in which the invasive body was technological and resulted in the human body mutating into a mesh of flesh and technological apparatus (see Figure 2). These films fixate on what happens to the notion of humanity once synthetic technology has invaded the body, looking primarily at how the body could be manipulated or controlled, either through outside forces or an internal loss of emotion or identity. The Hive continues these traditions, presenting technology primarily as an intensified antagonist and harbinger of doom to the conscious notion of self rather than interrogating technology as a contemporary construct removed from the body. As such, the various technologies they are discussing (video signals, industry, and the internet) also lose their specific identity and become collected under a singular object in opposition of the corporeal body. 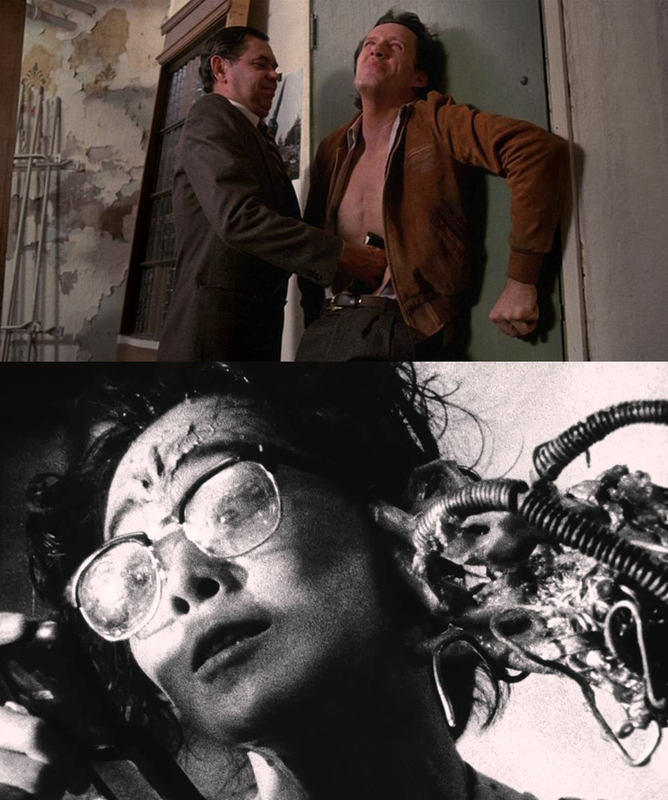 Figure 2: A videotape is inserted into the abdomen of Max in Videodrome (1983, above), while metal constructs burst through the skin in Tetsuo: The Iron Man (1989, below). Therefore, if our fears about technology now surround the loss of control and privacy as a result of our inability to properly comprehend the internet, how are these fears then realised in film? In the past few years there has been an attempt by filmmakers to position the computer screen as the central narrative location. In doing so, these films initially seem to offer up a drastically different formal presentation of film. By looking at three contemporary horror films which display their entire narrative to the audience through the computer screen – Joe Swanberg’s The Sick Thing That Happened to Emily When She Was Younger (2012) (hereafter referred to as The Sick Thing…), Zachary Donohue’s The Den (2013), and Levan Gabriadze’s Unfriended (2014) – it is possible to see how contemporary filmmakers approach fears about the internet. In terms of their narrative, these films follow a standard, linear progression. The Sick Thing… consists of a series of discussions between Emily and her partner through a voice chat program, in which Emily becomes increasingly worried about the various supernatural events occurring in her house. The Den follows Elizabeth’s online interactions as she studies online relationships, until she happens across footage of a murder and is then stalked both online and in reality by the murderers. Finally in Unfriended a group of friends are haunted by a vengeful ghost during a group Skype conversation on the anniversary of their friend’s death. What is interesting is how these narratives are presented to the audience. The pro-filmic shift between these films and other horror films can easily be seen just by comparing the screen captures featured within this article. No longer are characters and places matched across time and space through the cut, but now they are presented alongside each other, housed in different windows on the computer screen (see Figure 3). Though there is a history of split-screen storytelling which predates the personal computer, the organising of elements upon the cinema screen in an attempt to mimic a computer screen speaks to a familiarity on the part of the audience with the computer screen as a mode of receiving and processing information. In a way, this mise-en-scène works towards Lev Manovich’s idea of “spatial montage”, a conceptual possibility for how new media would represent images to the viewer. According to Manovich, spatial montage “could involve a number of images, potentially of different sizes and proportions, appearing on the screen at the same time”. The computer screens depicted in these films fulfil the basic criteria for spatial montage set out by Manovich, but they still employ more traditional aspects of mise-en-scène in their narrative presentation. Particularly in the case of The Den, framing and blocking is achieved through the use of computer windows by giving prominence to, or partially obscuring, elements of the webcam image by overlapping other computer programs, such as document folders or antivirus software windows, on top of it. 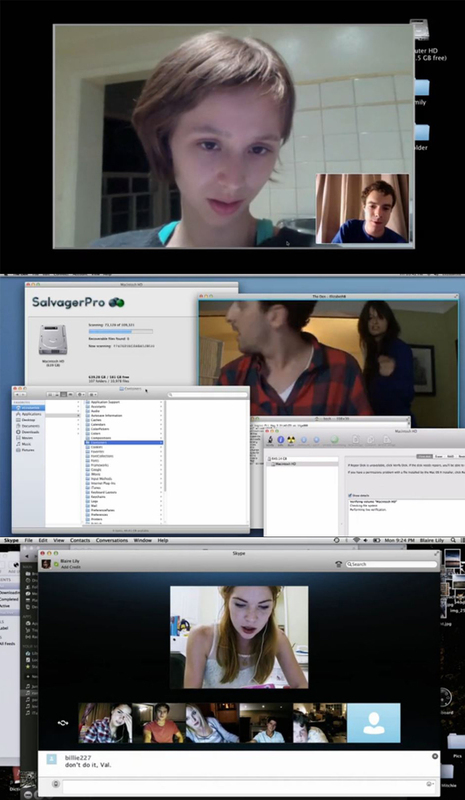 Figure 3: The evolution of representations of the computer screen in contemporary horror, as seen in The Sick Thing… (top), The Den (middle), and Unfriended (bottom). In the three films discussed, the loss of privacy or control plays a central role. In The Sick Thing…, though Emily’s partner often tells her he forgot to record the session, the very existence of the film relies on the computer screen being recorded. Therefore, the very act of watching The Sick Thing… brings to mind the issue of privacy, as the viewer witnesses private conversations between two people. In The Den and Unfriended, the computer is manipulated through outside sources, removing the control of the user and displaying information and images of the user without consent. Regardless of the origin of this loss of control, be it through hacking or ghostly manipulation, the fear generated through these films is less to do with the corporeal body and is focused instead on criticising our eagerness to interact with a technology we fail to fully understand. Ultimately all of these films work towards the idea that the internet does not function in the same way that society does and that it is easy to be misled. Minor actions such as hyperlinks redirecting the user to a different site or attacks by processes or viruses cause the computer to feel alien. The Storm Worm Trojan virus, for example, was attached to e-mails with a subject concerning the 2007 storm Kyrill and, once downloaded, created a backdoor allowing remote access and connected the infected computer to a botnet, thus not only invading but opening up the personal to an uncontrollable outside force. As such, the internet is positioned as a dangerous media, where users should be wary about who they are interacting with and what information they offer or allow access to, but are ultimately not allowed the freedom to control such information. In terms of narrative, Unfriended marks a clear divergence from the other films discussed here through its use of websites, online videos, and forum posts to disseminate background information and the majority of the general narrative. As such, the online interactions and dialogue over Skype largely exist as background noise and sites for moments of emotion and reaction, providing a human face to the frustration and anxiety that arises once control over the central character’s computer is taken away by the ghost haunting the group of friends. By clicking back and forth between various programs or internet tabs, Unfriended allows for a coherent narrative to generate through the linking of the constituent minutiae across different computer windows. In doing so, it maps contemporary means of acquiring and interrogating information, in which users will filter through multiple small pieces of information, either in pursuit of a specific detail or until something catches their eye. Though the above images show that all three of these films attempt to replicate the GUI of an Apple operating system, what is interesting is how quickly films have opted for the inclusion of real world program branding in order to present a more realistic realisation of the screen. In comparison to the other films, which made use of fictional programs, Unfriended makes use of well-known video upload sites such as YouTube or LiveLeak, as well as computer programs which require connection to the internet such as Spotify or Skype. As the user continues to lose control of her computer, the majority of these websites and programs become manipulated by the ghost; songs are played, windows are prevented from being closed, and new tabs are opened linking to particular past moments of the group of friends. In doing this, Unfriended highlights the ease at which control can be taken from the user, and how quickly our familiarity and ability to interact with these programs is lost once the GUI no longer fulfils its purpose as a way to comprehend the computer screen. In other words, once the familiar icons of the computer screen, such as the X housed at the top right of individual programs on a PC or the colour-coded circles at the top left of a program on a Mac, cease to function as expected then the user is reminded of their reliance on a pre-programmed list of functions. In these films, this loss of control (within the digital world) and the threat to the body (within the real world) are treated as equally horrific. The success of these films as pieces which interrogate our reliance on, and underestimation of, the internet relies heavily on an audience which is able to parse and understand exactly what is so horrific about these films. It is easy to look at the morals of each film – don’t trust internet interactions, the internet allows for horrible practices to occur, and that internet bullying is a serious problem in society – as reactionary and rather backward in their simplicity and positioning of the internet as inherently malicious. Yet, that these morals emerge consistently through the loss of control and privacy speaks to a far more prevailing fear with regard to our lack of understanding about how the internet actually operates. In Unfriended, the group of friends are haunted as much by the database of information they have uploaded to the internet as they are by the ghost itself. In The Den, the central character becomes a target through the seemingly benign action of switching between users on a randomised chat program, resulting in her coming across a horrible murder being broadcast online. In The Sick Thing… the interactions between the couple are revealed to be one-sided, with Emily being manipulated through the façade of distance that the internet creates (she believes her partner to be across the country, but it is revealed that he lives in close proximity to her). These films make this loss of control explicit through the manipulation of the GUI, allowing for the prioritisation of this fear on a visual level which can be understood by the average user. In other words, by presenting these narratives through a familiar format rather than through any attempt to visualise code, these films aim to engage the viewer to reconsider their position in the power structures of computer interactions. As such, they aim to criticise both our willingness to interact with the internet on a private level, and also the internet itself for its hidden processes designed to track and distribute information without consent. In both Unfriended and The Den the central characters are killed, whereas in The Sick Thing… Emily is left unaware of both the one-sided nature of her relationship and the actual geographical distance between her and her ‘partner’. That these films ultimately offer no solution suggests that the notion of horror in the digital age is one born from the growing realisation that we no longer understand the rules by which this new digital technology functions, and that society’s dependence on always online technology is past the point of return. See, for example, Abel Gance’s Napoleon (1927) and Richard L. Bare’s Wicked, Wicked (1973), the latter of which was heavily marketed through its use of ‘anamorphic duovision’. Connor McMorran is a PhD student at the University of St Andrews, working on his thesis concerning Korean genre cinema. His other interests include horror cinema, East Asian cinema in general, and the growing confluence between cinema and video games. Chun, Wendy Hui Kyong. (2006) Control and Freedom: Power and Paranoia in the Age of Fiber Optics. Massachusetts: MIT Press. Manovich, Lev. (2001) The Language of New Media. Massachusetts: MIT Press.